18. That’s the combined points in the Bulls four losses this season. Frustrating, yes. Encouraging, also yes. The Bulls have been close in every game this season. That’s a significant step forward from last year. An old football adage I was once told described the transition of a program: lose big, lose close, win close, win big. The Bulls are on step two, with some hints of moving to step three. Learning how to do that is difficult. You can’t really teach it. It has to come from experience, smarts, talent and heart. After two narrow losses to two of the MAC’s best teams, they will get that chance over the last five games. The Miami Redhawks thought they had the winning part down last year, when they started 0-6 and then won six in a row. But they’ve regressed, with three losses by less than six points. Facing the pressure of a preseason MAC favorite, their coach admits his team is feeling the heat to get their season turned around. So this is a critical game for both teams, as they try to stay on track for a bowl game and MAC East title. Bull Session Trivia: Miami fancies themselves the “Cradle of Coaches” with alums like Bo Schembechler, Woody Hayes, Paul Brown and Ara Parseghian. They also have two alums who are current NFL coaches. Can you name them? If Kyle Vantrease has to start at quarterback, he’ll be the first Bulls freshman to start since Drew Willy in 2005…Vantrease had the advantage of enrolling at UB in January, after graduating high school early. So he took part in spring practice, and has been in the playbook for almost a year…There’s really only one play Vantrease needs to know: throw it to #83! Anthony Johnson continues to amaze every week. He’s had back-to-back games of 140 or more yards receiving, and three on the season. His 771 yards are 4th in the nation, and 1st in the MAC. 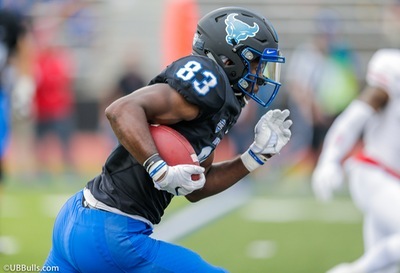 He’s on the way to becoming just the fourth UB receiver with a 1000-yard season…Partly due to Johnson, the Bulls have 13 plays of 45 yards or more. Johnson has five of them. The other nine are from eight other players…Getting the running game going again will be a priority for the Bulls the rest of the season. Northern Illinois held UB to just 39 yards on the ground, although the Huskies are the top run defense in the MAC. They also held the Bulls to just 2/14 on third down…UB’s offense ranks second overall in the conference in total offense, second in passing…For the fourth straight week, Johnson and the receiving corps will face an All-MAC cornerback. While Demetrius Monday (Kent State), Darius Phillips (Western Michigan) and Shawun Lurry (NIU) couldn’t slow them down, Miami’s Heath Harding will try on Saturday. He usually plays on the boundary (short) side of the field, so there may be some opportunities to move Johnson away from the Redhawks shutdown corner…Miami’s linebackers are strong. Brad Koenig leads the team in tackles, Junior McMullen is back from injury in the middle, and De’Andre Montgomery makes big plays. Last year against UB, Montgomery had fumble and interception returns for touchdowns…Last week, the Redhawks defense gave up 81 and 64 yard scores to Kent State…Overall, they are third in the MAC in total defense. The Bulls have a national leader, and its linebacker Khalil Hodge. With 19 more tackles against Northern Illinois, Hodge now has 101 on the season. His average of 14.4 per game leads the NCAA. It was his fourth game of the season with 17 tackles or more. Hodge obviously leads the MAC, and his total is 33 more than the #2 tackler in the conference…Cornerback Cam Lewis started for the first time since breaking his thumb. Playing with a club on his hand, he forced two fumbles last week. Despite the club, he says he could still intercept a pass if given the chance…Fellow cornerback Brandon Williams is playing well. He had seven tackles last week…The Bulls pass rush has turned it up. They have eight sacks in the last three games…One of them came from redshirt freshman linebacker Kadofi Wright, the first of his career…The Bulls two fumble recoveries were their first of the season…UB’s pass defense ranks second in the MAC, and 20th in the nation. In seven games, they have given up just 15 pass plays of 20+ yards…Miami starting QB Gus Ragland is injured, and will not play. Junior Billy Bahl will get his second straight start. Bahl has played parts of two seasons, and this will be his 14th career start. He started against UB in 2015. Bahl has a big arm, but has struggled with interceptions…He does have a great weapon in receiver James Gardner. The six-foot-four inch wideout leads the MAC with six TD catches. He and Anthony Johnson are the two best big-play receivers in the conference…Tight end Ryan Smith is also a weapon, and the most talented tight end the Bulls will see this year…After struggling for years, the Redhawks finally have a ground game. Kenny Young and Alonzo Smith both average five yards per carry, and have big play ability…Miami has allowed sacks, one of the worst totals in the MAC. With Bahl replacing Ragland for this week’s game, it will continue a trend the Bulls have seen, and dealt with themselves. Including this week, the Bulls will have faced only 2 starting quarterbacks in eight games. That means a quarterback who began the season as the starter and remained there. UB has seen four quarterbacks make their first career start against the Bulls. They have also seen two other backups start due to injuries or ineffectiveness of the season starter. On the Bulls end, if Van Trease starts, he’ll be the third different quarterback to line up under center. Looking at the MAC, only five teams have started the same quarterback all season. Why all the changes? Leipold cites pressure to perform, difficulty in finding top-flight QB’s and the new offenses that run the quarterback and expose them to more hits. Bull Session Trivia Answer: Baltimore Ravens head coach John Harbaugh and Los Angeles Rams head coach Sean McVay are both Miami University alums. Please join me, color analyst Scott Wilson, game host Brad Riter and postgame host Bob Gaughan for the broadcast on the Bulls Football Network. Our pregame show starts at 1:30pm. You can hear it in Buffalo on ESPN 1520 and in Rochester on Fox Sports 1280. A link to the online broadcast is also available here and on the Tune In app.